The price of a first-class stamp will break through the 40p barrier in April, Royal Mail has confirmed. First and second-class stamps will rise by 2p to 41p and 32p respectively on 6 April 2010, the company said. The move was expected, with regulator Postcomm announcing in September that it had given approval for stamp price increases in 2010. However, the cost of a first-class stamp will not go up as much as the 3p rise that the regulator had approved. Postcomm previously said Royal Mail needed the extra funding to compensate for the continuing decline in mail volumes. Customer body Consumer Focus said it was disappointed at the rise but "reluctantly accepted" that it was needed, adding that customers "can't keep on footing the bill". "Unless Royal Mail begin to deliver efficiencies through their modernisation programme and better industrial relations then consumers will rightly start to lose patience with Royal Mail," said Robert Hammond, postal expert at Consumer Focus. The price rises will affect standard letters weighing up to 100g. The increase is higher than inflation, but lower than the rise in April 2009. The prices for ordinary meter and account mail, largely sent by small businesses, will not increase - remaining at 36p and 25p respectively for standard letters weighing up to 100g, Royal Mail said. 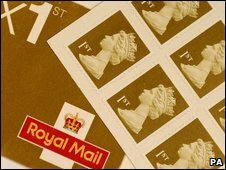 It said that the move reflected the continuing financial losses made by Royal Mail in collecting and delivering stamped mail, which amounted to £250m in 2008-09. Stamp prices were still lower than the European average, it said. "Stamp prices remain affordable and represent excellent value for money. Royal Mail continues to offer consumers a more extensive, to-the-door, six-days-a-week service than many European countries and does so at a lower price than most other operators," said Royal Mail's Alex Smith. "Small businesses who depend on Royal Mail's services to fulfil their customers' orders and to grow their businesses will be helped by our decision to hold prices for ordinary meter and account mail at today's levels." He added that the move would affect around 12% of mail sent in the UK, and would add around 3p a week to the average UK household's weekly 50p postage bill. The most recent figures revealed that Royal Mail had an operating profit of £184m for the six months to September, up 4% from a year ago. Revenues for the half-year fell £73m to £4.58bn, hit by the continuing decline in mail volumes and the recession. Royal Mail said its letters business had seen volumes fall to 72 million items a day, down by three million from last year. But profits were made in all four businesses within the Royal Mail group: the Post Office, Royal Mail Letters, Parcelforce Worldwide, and its European parcels business GLS.